"LA DANZA CREATIVA DELLE MANI"
"The creative dance of hands." Laura has pioneered the use of porcelain a hard, tough, rigid material to make flowing, free-spirited, warm-hearted, individualistic pieces. By design each pot by Laura De Benedetti is unique, hand-thrown on the potter’s wheel with its own personality. The rippling textures, gentle asymmetries and sensuous curves contrast with the anonymity of factory-made product, bringing to their owners a sense of freedom and liberty. Look for the signature twist in the rim of her plates and bowls, an expression of that spirit. In a period when so much ceramic art is abstract and conceptual, Laura has focused her art on the useful, practical objects that accompany us in our daily lives. She believes that pots are meaningful when they are put to use, so that their decorative and artistic qualities illuminate and accompany us, making the routine a little special. Bowls, plates, cups, mugs, jugs and teapots fulfil their functions, each similar, none the same. Tough, dishwasher-proof works of art for everyday use. Laura’s work is inspired by the vibrant, subtle colours of the Italian coastline in Liguria where she grew up. The sea and the sky, the sand and the rock, the flashes of colour from cliff-top wild flowers and the mysterious shades of dawn and sunset are reflected in her unique iridescent and crystalline glazes. 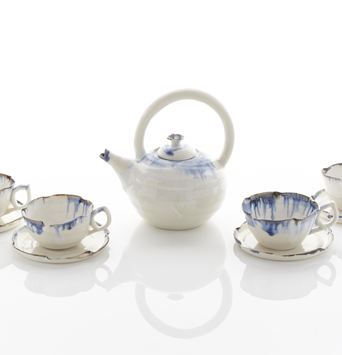 Inspired by the Japanese master Takeshi Yasuda, Laura undertook a major project entitled “100 Teapots”. In this work, she explored the infinite range of possibilities open to the artist in forming spouts, bodies, lids, handles and decorative elements. Each piece was unique, and the ensemble itself became a celebrated work, exhibited at “Art in Action” in 2012. Laura’s teapots are now collector’s items. The career of Laura De Benedetti spans 20 years of ceramic art. Qualified originally as a professional pharmaceutical chemist, Laura engaged with ceramics when her first child was born. Studying initially the pottery traditions of Piedmont in North Italy under a professional from Castellamonte, she took her second degree in Ceramic Art in the celebrated faculty of Media, Art and Design at the University of Westminster, graduating in 2007. In recent years her work has featured in Vogue and Homes and Gardens, has been sold at Nicole Farhi, the National Gallery in London, and at Heal’s in Tottenham Court Road London. 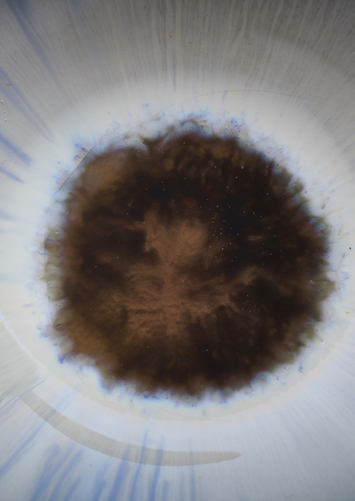 Beginning in 2009, Laura studied with internationally acclaimed artist Gareth Mason to create larger pieces – the largest pieces it is possible to turn on the wheel and to electric kiln fire. This gave birth to her great bowls. Broad and sweeping, yet thin and delicate, they resonate with the mysterious colours of a new rose crystalline glaze she developed specially. The harmony of form, colour and motif have created remarkable works of art, which were included in the “Best of the Best” exhibition at “Art in Action” in 2014 and displayed by galleries throughout the UK. London Potters News letter no.127 Dec -Jan 2008/2009 "Making pots for food"